The scholarships can help make college attainable for students and position them for career success. Growing up in the Bronzeville neighborhood of Chicago, Ill., education was an important part of Comcast Campus Recruiter Holly Doyle’s childhood. Influenced by her grandmother, whom she lived with, even the weekends were spent playing school. However, when it came time to apply to colleges, her family was not in a financial position to help. "I knew that if I wanted to go to school, I needed to apply for every scholarship, every opportunity that came my way," she said. More than 10 years ago, Holly applied for the Leaders and Achievers scholarship. With her outstanding commitment to her academics and community – she regularly mentored younger children, participated in cleanup projects, and knocked on doors to remind people to vote – she was selected as an award winner. "I was able to go to my top choice school, Howard University, and it spearheaded me into a position where I could get a degree, start my career, and now I’ve landed here at Comcast. Holly now works at Comcast’s headquarters in Philadelphia within the University Relations team. She proudly supports the Comcast Center Internship Program by helping to find, recruit and place new interns. 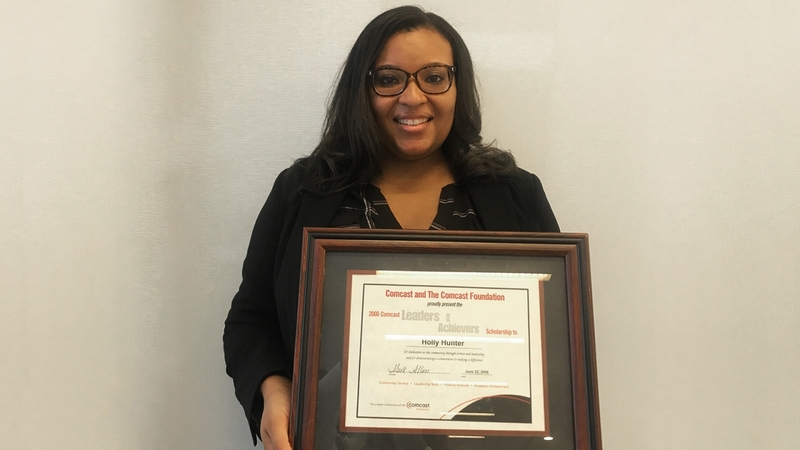 Growing up in a household served by Comcast for years, and then later being connected to the company by receiving the scholarship, Holly said, "It felt natural to join Comcast because it is a brand I love and trust." Scholarship applications are now open. Click here to see eligibility requirements and to submit an application today! If you know someone who would benefit from a Leaders and Achievers Scholarship, please encourage them to apply now.